"...we must guard against the acquisition of unwarranted influence, whether sought or unsought, by the military-industrial complex. The potential for the disastrous rise of misplaced power exists and will persist. We must never let the weight of this combination endanger our liberties or democratic processes." With these foreboding and prescient words, President Eisenhower bade farewell to the White House. And it is that speech that opens Why We Fight, winner of the Documentary Grand Jury Prize at the 2005 Sundance Film Festival. "Why We Fight" is a difficult question to tackle indeed, especially as writer/director/producer Eugene Jarecki does not limit it to the current conflict in Iraq, but attempts to explain why America has become, in the years since Eisenhower's farewell, such a belligerent nation. Why, indeed, are we engaged in seemingly perpetual conflict? Has the system established in the post-war years done more to produce combat than prevent it? The documentary is named after a series of Frank Capra films commissioned by the US Defense Department in the 1940s to explain the America 's entry into World War II. " The films made by Frank Capra are extraordinary," Jarecki says. "He patents elements of the American myth and lore: This idea that we will win, not because we are superpowerful, but because we are a motley collection of everyday people working together despite our differences. My film is still a Capraesque look at America ; it's inspired by the same aspirations of global democracy. It underscores the tragedy in the derailment of those qualities. Words we were supposed to idealize, such as 'democracy,' 'freedom of expression' and 'freedom of religion' are now being instrumentalised as 'logos' and used to promote an agenda. We are now delivering 'democracy' as if it were a pizza. "Americans have a visceral sense that something is rotten, but no one can seem to connect the dots," Jarecki continues. "All these crises around them are a kind of 'blowback' from previous hidden operations, so the general public is unable to put them into context. There is asymmetric information: people in power want to maintain an information advantage because there's a belief that 'we can't handle the truth.' My job as a filmmaker is to undo that and bring information to the public to challenge and correct that asymmetry. Ultimately, it falls to the citizen to be the watchdog function in the society. I wanted to make this film because we need what Eisenhower called 'alert and knowledgeable citizenry' to compel change, to improve the public's ability to monitor those in power." And despite the subject matter, the film manages to rise above the glut of partisan political documentaries that circulated during the 2004 election season. "I do not have a partisan film on my hands," Jarecki maintains. "This film is not about the Bush administration, for his policies were not born overnight. They are just an extension of what has been developing over the past 40 years. We will have Bush administrations forever unless we look at the system that produces them. "Republicans do not own the copyright on war-making in the United States," Jarecki points out. "One of the great myths in American life is that Democrats are somehow anti-war, which, as demonstrated by their position on the Iraq war, is clearly not true. As a party they are not very different, because they are beholden to the same phenomena. Our film is an effort to reach out in a non-partisan way to bring people together on issues that affect all of us. "This is a look at American militarism and to what extent Eisenhower's prophecy has come to pass," he continues. "A t a time of exploding defense profits, with an unprecedented number of former defense contractors working in government, it seemed right to ask, ' What are we doing? Why are we doing it? What is it doing to us? ' "
Today, the term "military-industrial complex" is bandied about with great ease, but the film takes the lid off the real meaning of the phrase coined by Eisenhower, and delves deep into the anatomy of the armaments industry. With unparalleled access to Pentagon personnel, national security advisors, top military strategists and think tanks, as well as CIA experts, US senators, fighter pilots, decorated veterans and historians, Why We Fight weaves together the complex tapestry of how the country got into this sorry mess. Chronicling with wonderful archival footage the last 50 years of American foreign policy, the nation's growing predilection for war is literally mapped out for us on the screen. It's a crucial lesson in geography, as distant parts of the globe all fall under the impact of US militaristic might. In the course of the film, some rather disturbing facts and figures are revealed: nearly $750 billion is spent on defense every year, more than all the other budget items combined. The armaments industry has become an unstoppable commercial machine (with parts of B2 bombers manufactured in every state to ensure political support) with huge profit margins, and hence has become a driving force that makes war happen. What is even more alarming is that this trend shows no sign of abating and is becoming more ingrained in policy-making. "The complex is so pervasive, it's become invisible," warns Senator John McCain. But the documentary is much more than a dry inquiry featuring a collection of shocking statistics and distressing soundbites from experts; it also features some humorous moments as well as moving personal stories. A woman at a weapons manufacturing plant confesses that she'd rather be "making toys for Santa." An Iraqi man who lost his family, courtesy of a "smart" bomb aimed at Saddam Hussein's bunker, wonders sadly about the purpose of American intervention. A disenchanted Air Force officer who resigned from the Pentagon (out of contempt for the editing of intelligence on Iraq by the "Office for Special Plans") admits that she does not wish her children to join the Army. Meanwhile, in another state, a young Army recruit sees the military as his last means of economic salvation. "The crucial notion is that we have a poverty draft," Jarecki notes. "It may look voluntary, but it's not. It's not semantic to say so, but joining the military is the best game in town for people in the inner cities and forsaken heartland. Adam Smith's invisible hand is drafting people instead of Uncle Sam's pointed finger." Yet of all the portraits, by far the most poignant is that of Wilton Sekzer, a retired New York City cop who, struggling with the grief of losing his son in the World Trade Center on September 11, 2001, petitions the military to write his son's name on a bomb destined for Iraq. When it later becomes clear that Iraq had nothing to do with 9/11, Sekzer wearily admits his anger at how the government exploited his mourning and patriotism. Once the editing began, Jarecki realized that the problem was far more complex than he wished it to be. "You want there to be good guys and bad guys, but instead there's a complex web of forces acting upon and through individuals who, like all of us, combine some sound and unsound thinking," he explains. "There is nobody in our film that is a villain or a hero; they are simply caught in a vortex of spiraling militarization and moral and economic bankruptcy, and they feel remote from and powerless to change those forces. "After making The Trials of Henry Kissinger I realised that the audiences were too focused on Kissinger the man, rather than understanding that he represents the system that employs him," Jarecki continues. "The cult of personality, which dominates American thought, gives you a limited outlook. We tend to hunt for heroes and villains, rather than study roots of the problem. I wanted to make a film that goes beyond the focus on the individual." So has the current administration seen the documentary? "Even if the film lives in a non-partisan world, it does not mean that others do," Jarecki notes. "The White House does not take well to introspection. He adds that "German and British forces have asked to use the film for recruitment of their troops." 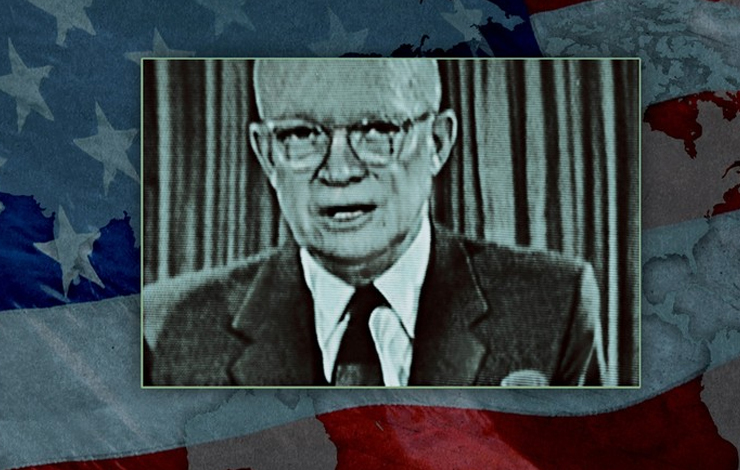 Forty-five years later, Eisenhower's prognosis has come true; what were once words of warning have turned into a blueprint for US foreign policy. As the casualties and bloodshed continue in Iraq, it seems that democracy is closer to becoming "the insolvent phantom of tomorrow." By merely letting the footage convey its message, Jarecki is part journalist, part sage, part poet, part historian. The result is a terrifying, dispiriting, haunting, yet wonderful filmthe necessary dose of strong medicine needed to awaken what Gore Vidal calls the "United States of Amnesia." Darianna Cardilli is a Los Angeles-based documentary filmmaker and editor. She can be reached at www.darianna.com.